There was a time when teletext pages could only be created by a privileged few with access to specialist terminals that required rechargeable batteries and seven hamsters on wheels to function. But modern compooters eradicate the need for such things, which is a good job because I don’t think I could afford the hamster food. Anyhow, peruse the following information and you can design your very own teletext pages. Who’d have thought it? Certainly not the hamsters. One condition: you must send me your own designs! Well, that’s not imperative, but I’d love to post your content on this blog. 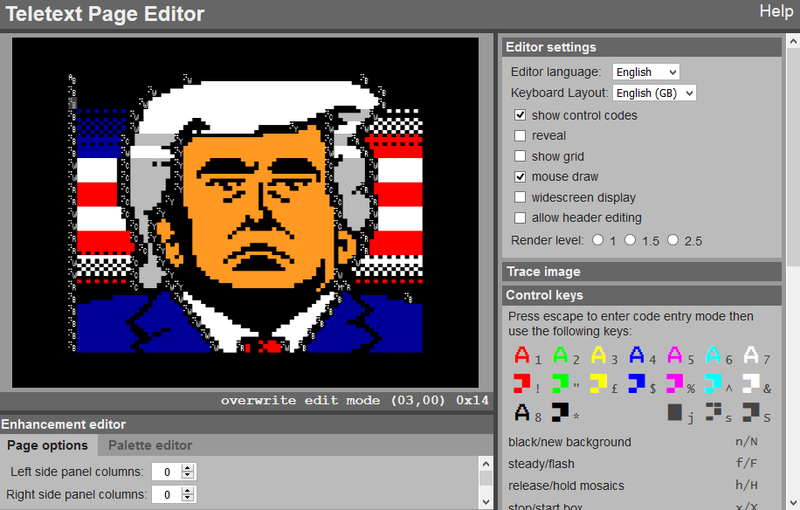 The edit.tf online editor was created by Simon Rawles in 2015 to accompany the Teletext40 ’40 Years of Teletext’ project. It will run in every browser… that we know of! Let us know if something’s wrong. This page editor allows you to export in various teletext formats including EP1, TTI (as used by VBIT Pi) and TTX in addition to PNG. See here for a quick start guide. See here for more information on the editor’s development. The Teletext Block Party Blog has loads more information including pages made by visitors to workshops. The ZX Teletext Page Editor is maintained by Alistair Cree and serves as a companion, not a competitor, to Edit-tf. It includes features for Level 2.0 page editing, which allows for use of extra colours including orange. The world’s first multi-user teletext editing environment, MUTTLEE allows people from across the globe to edit a teletext page simultaneously. Developed by wxTED and Teefax engineer Peter Kwan, it debuted at Wigan Bloktoberfest in October 2018. An editing cheat sheet is available here. 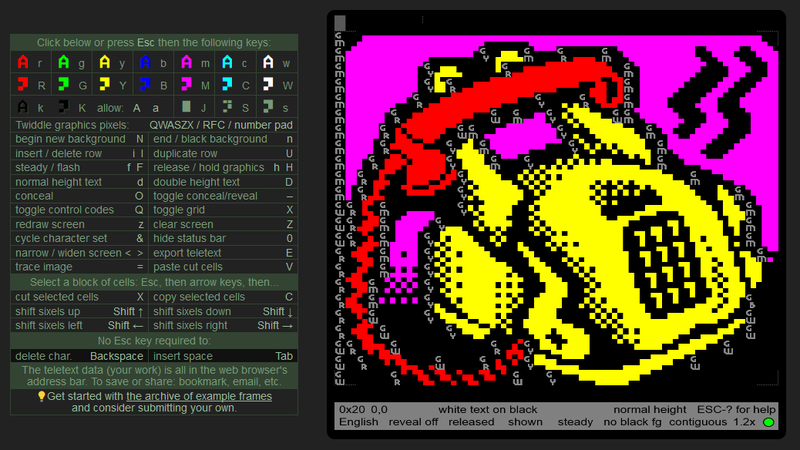 Created by Peter Kwan, wxTED is (currently) a Windows-only teletext editor. It is highly recommended for organising pages and carousels for Alistair Buxton & Peter Kwan’s Raspberry Pi software. CebraText was originally created for the Cebra teletext inserter, but you don’t need an inserter to use it. The program is free, after all! See here for a basic tutorial, or here for how to import bitmaps. And here‘s yet more information on making pages. Note: CebraText will not install on 64bit operating systems such as Windows 8. This cat told me so. My interview with Digital Arts Online contains more detailed information on creating teletext pages.